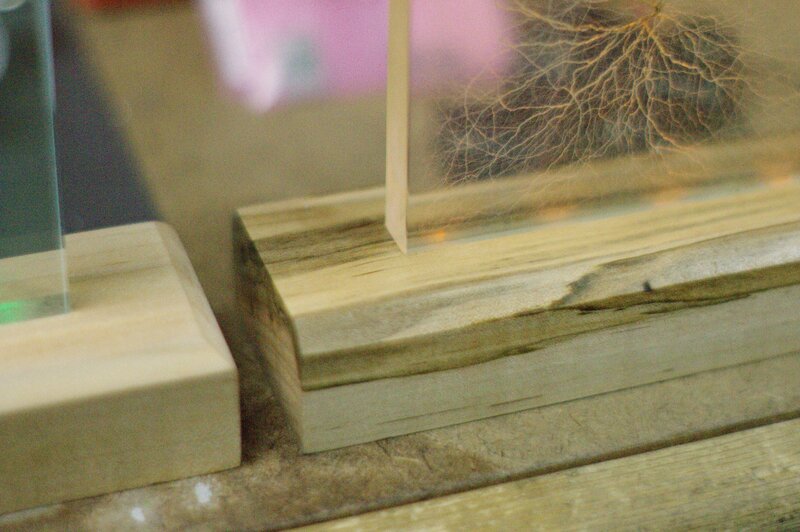 Recently, Andrew and I were invited by the operators of High Tech Art and Stoneridge Engineering to try our hand at the process of making Lichtenberg figures. We excitedly purchased a big slab of acrylic and a roll of lead sheet from McMaster-Carr and cut out some masks to fit the acrylic. After some experimentation with CNC mills and other tools, we learned that the easiest way to cut 1/16″ thick lead sheet is by hand with a sharp knife. The knife needs to be oiled often because lead tends to stick to other metals. The acrylic sheets were cut to size in i3’s laser cutters, which did a remarkably good job slicing through 1/2″ thick acrylic. Since we were aiming for a more finished look, we used a router to square up the edges and later sanded and polished. All this is was in preparation for irradiation under a 5 MeV electron accelerator, which sat on the other side of an 8 foot thick concrete wall from us. A technical issue limited the accelerating voltage we could use, however this only limits the depth that the beam will penetrate acrylic. This machine, at Mercury Plastics’ Neo-Beam facility, is normally used to finish products such as PEX tubing, which needs high-energy cross-linking to enhance its chemical resistance and strength. However, for about 9 hours on a wintry Friday last November, the team loaded up the cart towline with over 1360 acrylic parts just to make pretty things. Those lead sheets I mentioned earlier are laid over the acrylic to absorb the charge if complex designs are desired in the exposed area. Otherwise, the entire block gets uniformly exposed, which can also produce beautiful results. The massive built-up charge needs to be discharged very fast to create the pretty Lichtenberg figures. A mechanical shock is delivered at a single point, giving that charge a path to escape. Much like lightning, this happens very quickly and results in the beautiful fractal patterns etched inside the material. Larger figures sometimes continue sparking for hours after triggering the discharge. These things look best when edge-lit with LEDs, so we spent the following weeks in the wood shop milling and finishing some bases from oak and maple. One of the Lichtenbergers even ran a lead-shielded GoPro through the beam! Many thanks go out to Bert Hickman, Colleen Kobe, and Todd Johnson for organizing everything and to Mercury Plastics.